State Minister for Science, Technology, Energy and Mining, Hon. 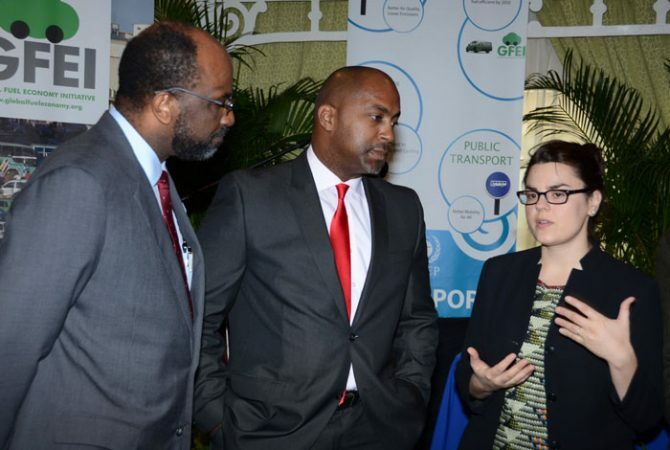 Julian Robinson (centre) and Chairman of the Jamaica Automobile Association (JAA), Earl Jarrett (left), listen to Project Manager, Transport Unit,United Nations Environment Programme (UNEP), Elisa Dumitrescu, at the Cleaner Fuels and More Efficient Vehicles Conference for the Caribbean, held on February 3, at the Knutsford Court Hotel in Kingston. This is being achieved through several measures, including the implementation of Jamaica’s National Energy Policy (NEP). The policy aims to facilitate the establishment of a comprehensive programme of efficiency improvement and energy diversification. The policy specifically speaks to a transport sector strategy with measures such as energy conservation. Jamaica is among the leading countries taking concrete steps to eliminate harmful vehicle emissions. According to State Minister for Science, Technology, Energy and Mining, Hon. Julian Robinson, this is being achieved through several measures, including the implementation of Jamaica’s National Energy Policy (NEP). The policy aims to facilitate the establishment of a comprehensive programme of efficiency improvement and energy diversification to provide high‐quality, affordable, environmentally‐friendly energy and to reduce the country’s dependence on high‐cost imported oil. The policy specifically speaks to a transport sector strategy with measures such as energy conservation, including: efficient traffic management; car pooling; park and ride; use of clean fuels to minimise pollution; flexi-work hours and tele-commuting; an efficient public/urban mass transit transport system; encouraging non-motorized transport; and promoting vehicle and road maintenance programmes. Addressing the Cleaner Fuels and More Efficient Vehicles Conference for the Caribbean, at the Knutsford Court Hotel, in Kingston, on February 3, Mr. Robinson highlighted the Government’s mandating of 10 per cent ethanol blended automotive petrol in 2011, as one of the measures that has been implemented to reduce vehicular pollutants. 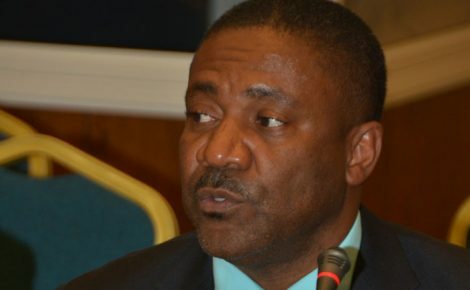 He further noted that an Ultra Low Sulphur Diesel was introduced in June 2013, despite the fact that the maximum allowable sulphur level in diesel fuel is 5000 parts per million (ppm), and the actual sulphur grades of diesel found in Jamaica range between 11 to 50 ppm. In addition, it is also now legal to blend biodiesel to diesel up to five per cent by volume. 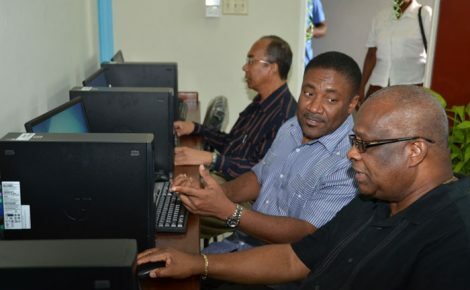 Mr. Robinson informed that plans are also in place to upgrade the 35,000 barrels per day hydroskimming refinery to more modern and efficient processing and waste treatment units. The State Minister pointed out that the age cap of five years placed on imported motor cars; six years for pick-ups and 10 years for trucks, trailers and other heavy duty vehicles, is another strategy to lower vehicle emissions. 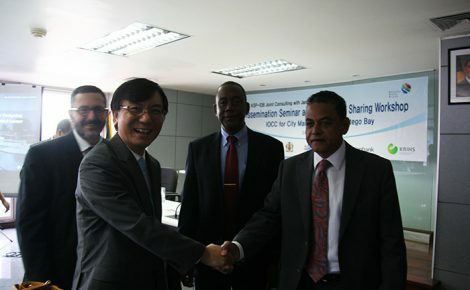 This, in addition to the plan for the importation of efficient as well as clean technology vehicles. In the meantime, Manager, CARICOM Energy Programme, CARICOM Secretariat, Joseph Williams, lamented the lack of quality data in the Caribbean’s transport sector, which is needed to adequately inform the formulation of policies and implementation of strategies, to address the issue of vehicle emissions and fuel quality standards. The two-day conference was initiated by the Partnership for Clean Fuels and Vehicles (PCFV) and the Global Fuel Economy Initiative (GFEI), and is organised by the United Nations Environment Programme (UNEP), the FIA Foundation and the Caricom Secretariat. Its main objectives are to strengthen vehicle emission and fuel quality standards; and promote fuel economy to support a more fuel-efficient auto fleet in the Caribbean. The broad targets of the conference are to sensitise policymakers in the region about the importance of cleaner fuels; and to educate motorists about the fact that more efficient vehicles can improve air quality and urban health, as well as improve climate and environmental protection. It will also seek to provide a better understanding of the potential gains from improving the efficiency of the Caribbean’s future car fleet.